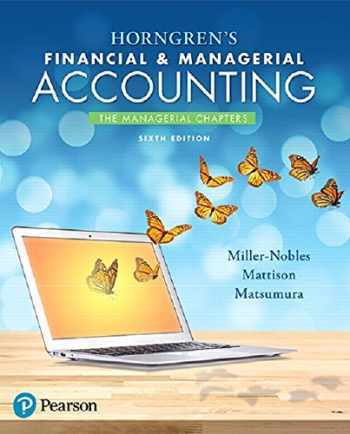 Acknowledged author Ella Mae Matsumura wrote Horngren's Financial & Managerial Accounting, The Managerial Chapters Plus MyAccountingLab with Pearson eText -- Access Card Package (6th Edition) comprising 896 pages back in 2017. Textbook and etextbook are published under ISBN 0134674677 and 9780134674674. Since then Horngren's Financial & Managerial Accounting, The Managerial Chapters Plus MyAccountingLab with Pearson eText -- Access Card Package (6th Edition) textbook was available to sell back to BooksRun online for the top buyback price of $51.08 or rent at the marketplace.